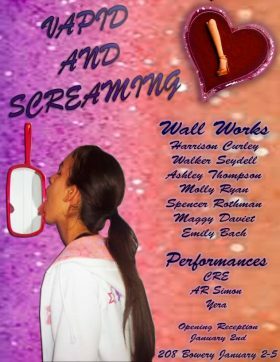 This show has the unique aspect of being an almost half-and-half split of performance and visual art, with seven visual artists and performance work by three artists. The opening starts at 8 pm, and two DJs will spin throughout the reception. Expect word art, GIFs, collage, vibrant colors, and other surprises. Opening Thursday January 5, 6 pm at Marc Straus Gallery. On view through February 10. Just behind the space where November’s The Apotheosis of the Fish Market took place– inside a vacant seafood market on Grand Street– the artists will be returning to their home base at a gallery a few doors down for a duo of solo shows. Two painters, Ulf Puder and Liliane Tomasko, both painters, will show their unique brand of creation. 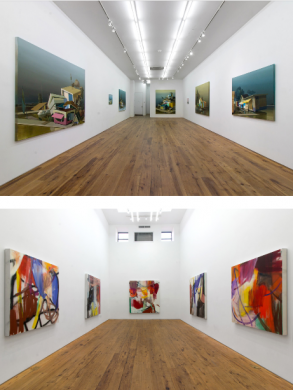 The two artists create paint works of varying sizes, both with a distinct color palette and style. Puder, who has shown at Marc Straus two times previously, specializes in soft, surreal yet detailed renderings of architectural forms using mostly cool colors with a splash of pastels. Swiss painter Tomasko’s work, on the other hand, is more bold and unapologetically abstract, creating worlds where brash and aggressive brush strokes reign supreme and it’s almost a war of bold colors and lines. Their differences and similarities make for a pleasing pair. 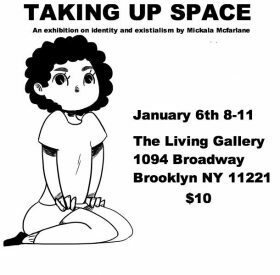 McFarlane’s colorful, cartoonish drawings depict black femmes and other characters (mostly humans, sometimes beings that look more like aliens) doing everyday activities, lounging big-eyed and blushing, or simply just… taking up space. A $10 donation is requested at the door, but before you turn up your nose at the idea of paying for an art show, remember that art spaces supporting independent creators are disappearing quickly across the city, and your support will be the stuff keeping them alive. Also, once you’re in the door you’ll get free drinks. Everyone likes free stuff. Opening Friday January 6, 7 pm to 9 pm at Amos Eno Gallery. On view through January 29. 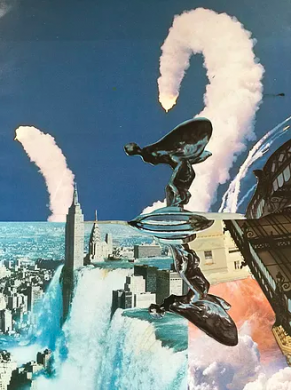 Collage is an interesting medium, where the simplest of photos and scraps can be fused together to make something worth hundreds of dollars that people flock from all over to gaze at. Andre Rubin’s new solo show at Amos Eno Gallery on Bogart Street (an artist-run space founded in 1974!) showcases an assortment of “approximately 35” collages that “explore timely philosophical and political themes.” Though it’s not immediately clear what these themes are, the fact that they must be there, somewhere makes the eye linger a little longer on Rubin’s already compelling creations, which feature imagery of the Manhattan skyline, angelic sculptures, iPhone lock screens, and advertisements. Some are more patchworky, where lines clearly where one image ends and another begins, and others are more of a streamlined work, where you’re stuck wondering what is collaged and what already existed.